Join Peggy Ashbrook at our Growing Community event on April 7. When we complete this sentence in our heads, many of us insert the word “play.” Connecting young children with experiences in nature builds their confidence as they enter natural spaces, opening up more possibilities for play. Throughout a city there are the small spaces where nature exists alongside human-built structures and larger areas where it is intentionally integrated. Outside and inside buildings, children engage with nature—playing on grass lawns, weedy patches, trees, and flower beds; observing ants in a sidewalk crack; digging in dirt to find worms; and getting rid of other unwanted small animal species that colonize indoors buildings and homes. Learning about nature and natural phenomena involves engagement—seeing, smelling, hearing, and touching the nature around us—playing with nature. If we momentarily stop to observe, perhaps touch, and comment about what we notice, even brief observations in familiar landscapes are an introduction to living plants and animals. Which leaves are smaller than a fingernail and which are larger than a hand? What are the textures of different leaves? With more experiences playing outside children become familiar with some of the living organisms that exist in particular play areas, and locations become known for the life they support—the garden bed where the tulips they planted are sprouting, a fruit tree where bees visit flowers, a stepping stone where roly-polies can always be found underneath, or the edge of the playing field where grasshoppers live. Children and adults will become comfortable in “their” space. When children play they develop language, executive functions, mathematics and spatial skills, scientific thinking, and social emotional development because they are mentally active, engaged, socially interactive, and building meaningful connections to their lives (Hassinger-Das and all, 2017). In this photograph, a child stands at the edge of a parking lot, interacting with nature and getting to know the structure of plant leaves and sticks as she tears and manipulates them to create a pretend meal. 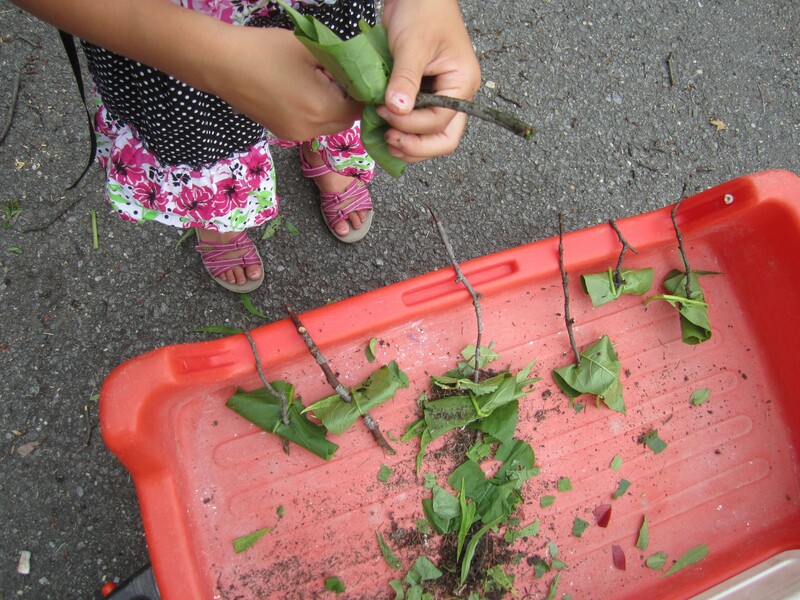 A small amount of nature is the basis for this meaningful play. Do you have a memory of an unforgettable experience with nature from your childhood? Peggy Ashbrook is an early childhood science teacher, mentor and writer—the National Science Teachers Association’s (NSTA) Early Years column in Science & Children and companion blog, and author of “Science Learning in the Early Years” (2016 NSTA Press) and “Science Is Simple” (2003, Gryphon House). Her favorite place is where the worlds of early childhood and science learning overlap. The Case of Brain Science and Guided Play: A Developing Story by Brenna Hassinger-Das, Kathy Hirsh-Pasek, and Roberta Michnick Golinkoff. 2017. Young Children. 72(2): 45-50. The Nature of Americans: Disconnection and Recommendations for Reconnection by Dr. Stephen R. Kellert, David J. Case, Dr. Daniel Escher, Dr. Daniel J. Witter, Dr. Jessica Mikels-Carrasco, and Phil T. Seng. DJ Case & Associates. 2017. “Nature and Childhood Development” Chapter 3 in Building for Life: Designing and Understanding the Human-Nature Connection by Stephen R. Kellert, Washington, D.C.: Island Press, 2005.